Swiveling 7" dia. top plate. 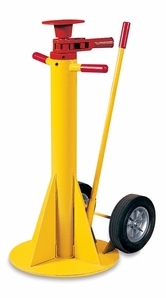 Height Range 40 1/2"-54" Top 7" Base 19" Load Bearing Capacity 75,000 lbs. • Class 2G Acme screw threads for a smooth fit and good support. • Removable bushing to allow replacement of screw assembly. • Swivel head tilts 9" to reduce side load bending force. • Zerk fitting provides uniform and constant lubrication of screw threads. • Bolt and washer prevent over-extension of screw. • Steel sleeve protects axle. • Spare parts always available. • Powder coated yellow finish. • Wt. 169 lbs.